A beautiful set of antique taxidermy Impala horns. 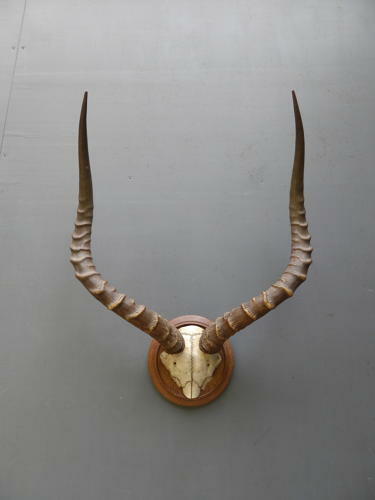 A stunning mount, the impressive symmetrical horns with a wonderful colour & texture on their original partial skull cap. Mounted on a diminutive turned hardwood mount allow the horns themselves to be the main the focal point making this a fantastic & unusual display piece. Wear commensurate with age, excellent original condition, faultless & ready to hang. Measurements above are taken in a straight line.